Ecological footprint of university students: Does gender matter? To determine if there is a gender difference in the resource consumption activities of students in Central Mindanao University, a Philippine state university, an ecological foot printing study was conducted in August 2014. Consumption data from 380 student respondents were gathered using a survey questionnaire. A web-based software created by the Global Footprint Network was used to convert the consumption data into its equivalent ecological footprint value. Sample size was reduced to 324 (male = 162; female = 162) through a 1:1 nearest neighbor matching without replacement method for propensity score matching. Subsequently, unpaired t-test was employed for comparing the difference in ecological footprint between the male and female student respondents. Results reveal that the students’ ecological footprint is slightly lower than the national average. Furthermore, most of their ecological footprint comes from their carbon footprint. Male respondents were found to have a significantly higher ecological footprint compared to female respondents. This implies gender difference in terms of resource consumption. Blocker, T. J.; Eckberg, D. L., (1997). Gender and environmentalism: Results from the 1993 General Social Survey. Soc. Sci. Quart., 78 (4): 841-858 (18 pages). Chen, T.B. ; Chai, L.T., (2010). Attitude Towards the Environment and Green Products: Consumers' Perspective. Manage. Sci. Eng., 4 (2): 27-39 (13 pages). Cortese, A. D., (2003). The critical role of higher education in creating a sustainable future. Plann. High. Educ., 31(3): 15-22 (8 pages). Ewing, B.; Moore, D.; Goldfinger, S.; Oursler, A.; Reed, A.; Wackernagel, M., (2010). The ecological Footprint atlas 2010. Oakland: Global Footprint Network. Gimenez-Nadal, J.I. ; Molina, J.A., (2016). Commuting time and household responsibilities: Evidence using propensity score matching. J. Reg. Sci., 56(2): 332-359 (28 pages). Hunter, L. M.; Hatch, A.; Johnson, A, (2004). 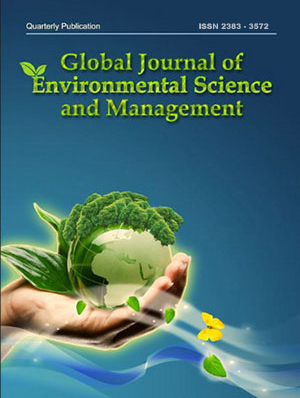 Cross‐national gender variation in environmental behaviors. Soc. Sci. Quart., 85 (3): 677-694 (18 pages). Johnsson-Latham, G., (2006). Initial study of lifestyles, consumption patterns, sustainable development and gender: Do women leave a smaller ecological footprint than men?. Swedish Ministry of Sustainable Development. Kitzes, J.; Peller, A; Goldfinger, S.; Wackernagel, M., (2007). Current methods for calculating national ecological footprint accounts. Sci. Environ. Sustain. Soc., 4(1): 1-9 (9 pages). Kwan, M.; Kotsev, A., (2014). Gender differences in commute time and accessibility in Sofia, Bulgaria: a study using 3D geovisualisation. Geog. J., 181(1): 83-96 (14 pages). Lee, K., (2009). Gender differences in Hong Kong adolescent consumers' green purchasing behavior. J. Consumer Market, 26 (2): 87-96 (10 pages). Medina, M.A.P. (2015). The sustainability of on campus residence: A utilization of ecological foot-printing in a State University in Mindanao, Philippines. Adv. Environ. Sci., 7(1): 1-10 (10 pages). Permana, A.S.; Aziz, N.A. ; Siong, H.N., (2015). Is mom energy efficient? A study of gender, household energy consumption and family decision making in Indonesia. Ener. Res. Soc. Sci., 6(1): 78-86 (10 pages). Rahut, D.B. ; Behera, B.; Ali, A., (2016). I Household energy choice and consumption intensity: Empirical evidence from Bhutan. Ren. Sus. Ener. Revs., 53(1): 993-1009 (17 pages). Raj, S.; Goel, S.; Sharma, M.; Singh, A., (2012). Ecological Footprint score in university students of an Indian city. J. Environ. Occup. Sci., 1(1): 23-26 (4 pages). Räty, R.; Carlsson-Kanyama, A., (2009). Comparing energy use by gender, age and income in some European countries. Research Support and Administration, Swedish Defence Research Agency (FOI). Rees, W. E., (2003). Impeding sustainability. Plann. High. Educ., 31(3): 88-98 (11 pages). Rosenbaum, P. R.; Rubin, D.B., (1983). The central role of the propensity score in observational studies for causal effects. Biometrika., 70(1): 41-55 (15 pages). Segovia, V.M. ; Galang, A.P., (2002). Sustainable development in higher education in the Philippines: The case of Miriam College. High. Educ. Pol., 3(3): 288-297 (10 pages). Shen, J.; Saijo, T., (2008). Reexamining the relations between socio-demographic characteristics and individual environmental concern: Evidence from Shanghai data. J. Environ. Psychol., 28(1): 42-50 (9 pages). Solar. V.A., (2011). Gender and natural resource consumption. Int. J. Environ. Sci. Dev., 2(5): 399-401 (3 pages). Thoemmes, F., (2012). Propensity score matching in SPSS. arXiv preprint arXiv:1201.6385. Tindall, D. B.; Davies, S.; Mauboules, C., (2003). Activism and conservation behavior in an environmental movement: The contradictory effects of gender. Soc. Nat. Resour., 16(10): 909-932 (22 pages). Zelezny, L. C.; Chua, P. P.; Aldrich, C., (2000). New ways of thinking about environmentalism: Elaborating on gender differences in environmentalism. J. Soc. Issues., 56(3): 443-457 (15 pages).